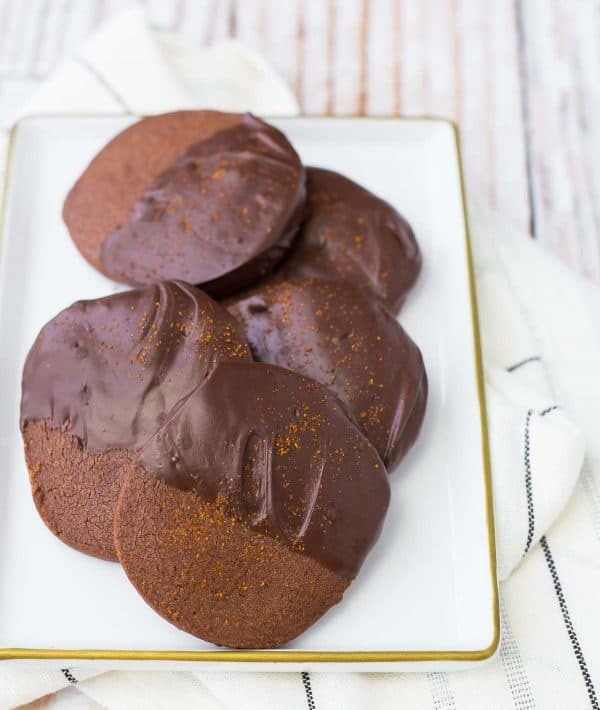 Perfect any time of year, but super perfect on your Christmas cookie tray, these Mexican Chocolate Cookies are an easy sweet and just slightly spicy slice-and-bake shortbread recipe. Shortbread cookies are my favorite kind of cookies to make. Anyways, shortbread cookies. I love their smooth, rich, buttery flavor. I also adore their versatility — they’re a blank slate for any flavor you love. I love these bright lemon poppy seed cream cheese shortbread cookies, and these peppermint shortbread cookies are perfect for Christmas. But hey if neither of those sound delicious to you, I’ve got you covered with more Christmas festiveness – how about these gingerbread shortbread cookies with a fun add-in or these holiday funfetti shortbread cookies? Or maybe you’re still feeling those fall vibes and want to try apple cheesecake shortbread cookies? Perhaps you love the idea of the lemon in the lemon poppy seed cookies but you’re not a fan of poppy seeds? Have no fear! How about honey lemon shortbread cookies or honey, lemon, apricot and pine nut shortbread cookies? Or it could be that you came here looking for chocolate but the idea of the cayenne is a little much for you (but it’s so good, by the way!)? If that’s the case, try these cream cheese cocoa nib cookies. Whew! Still with me? Anyone ready to check me into SA (Shortbreadaholics Anonymous)? If we’re really being honest, which I always am with you guys, one of my favorite things about shortbread cookies is the fact that they are…. Did you know I was going to say that? I’m nothing if not predictable. I tend to make Christmas cookies pretty far in advance so I can share them here with you, so then I have two choices. The first is the freezer. The second is to eat them all and make more for Christmas. Obviously I prefer the first choice because a) it leaves me skinnier and b) it’s less work. Shortbread freezes like a dream. I’ve frozen the dough for all the cookies I linked to in that link-heavy paragraph up there. You can freeze the dough or the finished cookies. I love freezing the dough because then I can grab it out when I need it, slice it, and bake. 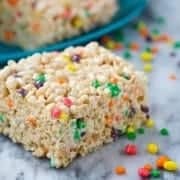 Fresh cookies, quick and easy! 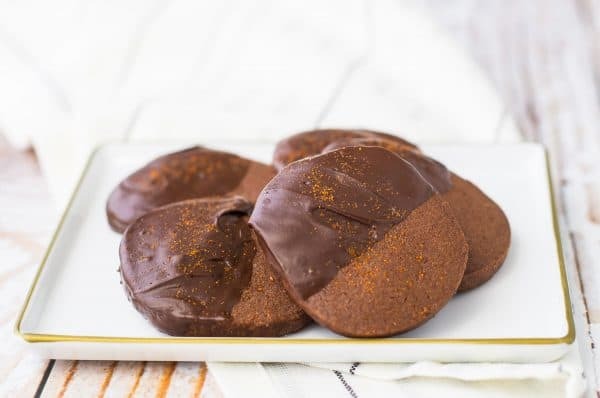 These particular Mexican chocolate cookies are rich and chocolatey with a subtle touch of spice. They have cinnamon, nutmeg and cayenne. However, they’re by no means spicy, they just give the cookies that extra intrigue that will have everyone asking for the recipe. The extra sprinkle of cayenne on top is completely optional, and that will add an additional layer of heat. 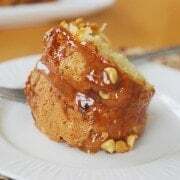 I’ve partnered with Bob’s Red Mill to bring you this recipe. 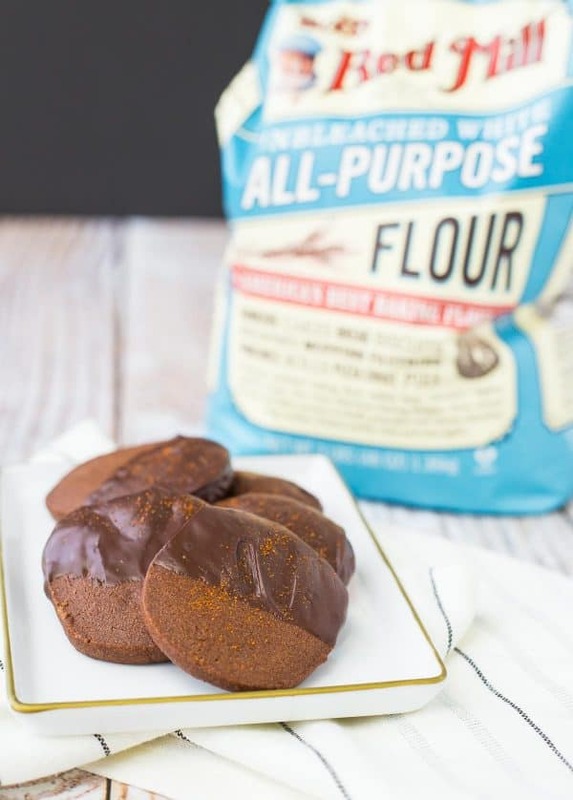 Many of my recipes can be made with white whole wheat or whole wheat flour but for these Mexican chocolate cookies, I’d recommend Bob’s Red Mill Unbleached All-Purpose Flour – it helps gives these cookies their velvety smooth texture. In a medium bowl, combine Bob’s Red Mill All-Purpose Flour, cocoa powder, cinnamon, nutmeg, salt, and cayenne. Set aside. In a stand mixer fitted with the paddle attachment, cream butter, powdered sugar, and vanilla extract until smooth. Gradually add flour mixture and mix on low until combined. Dough will be thick. On wax paper or parchment paper, form into a 12- to 14-inch log and freeze at least 30 minutes or until firm. When ready to bake, preheat oven to 350 degrees Fahrenheit. Cut the shortbread dough into 1/4-inch slices and bake for 13-15 minutes on parchment lined baking sheets. Place a heat-safe bowl (I recommend glass!) on top of a pan with an inch or two of water in it. 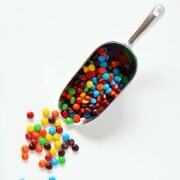 Place chocolate chips in bowl. Heat on stove over medium heat, stirring chocolate until melted. Dip cookies in chocolate and return to a parchment paper lined baking sheet to harden. If desired, sprinkle with more cayenne before chocolate has set. Note: If you freeze the dough for longer than 30 minutes, you may have to let it set out at room temperature for 30 minutes or so to achieve uniform slices. Note: Yield of this recipe will depend on how thickly you slice the cookies. Verdict: I loved these Mexican Chocolate Cookies – they were a nice change from traditional sugar cookies. Husband’s take: He hasn’t tried these yet (they’re in the freezer!) but my sister tried one and gave rave reviews. I luv shortbread!! have some mex. choc. will make these. do you freeze the dough to save or freeze the baked cookies??? I like to bake ahead too. these sound amazing! starting to think about what christmas cookies i want to make this season, and these sound like the perfect combo of delicious and stable (they won’t crumble in the mail!). I love anything and everything with cocoa powder! I’m curious about the spicy part. I love cayenne but have never put it in my cookies! Neat idea! May I ask, how mnay grams or tbsp are 2 sticks for butter? I love the idea of spicy chocolate chocolate cookies. Must try! Ooohhh….cayenne powder…I bet I would LOVE these!!! I LOVE the spice in these cookies! Brilliant! Oh yeah, these sound amazing!! Can’t get enough chocolate this time of year! I love the addition of cayenne pepper! It gives the cookies a great new twist! These are so perfect, I love the flavors! Love this combo! I’m a sucker for anything with a little bit of heat in it! I have my glass of milk, I’m ready for these cookies now! 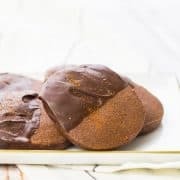 I finally got to make this Mexican chocolate cookies shortbread this past weekend, and it was such a hit!! I made it for my family, and it was a kids favorite. Thx for sharing! I’m so glad you liked these! Thanks for taking the time to come back and leave a comment!